Shotgun Pistol. Shells and other beasties. I spent a full day in the shed this week working on the gun and shells. I have the shells (shotgun cartridges) nearly completed. They’re made from brass and are 1 part found object, 1 part made object. 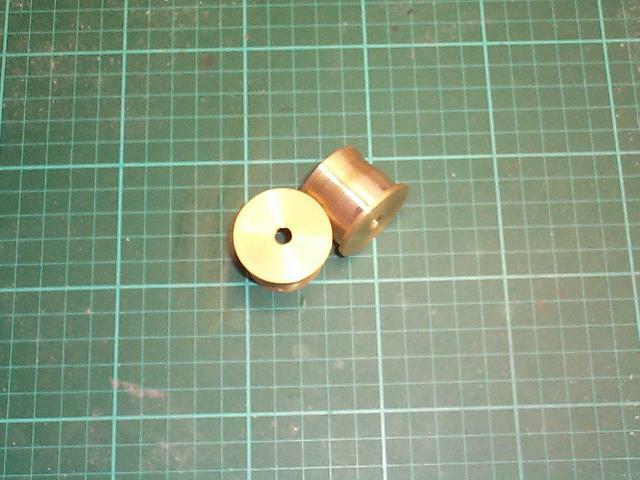 The outer shell is part of a hose fitting I bought from a hardware shop, disassembled and slightly re-shaped, the flat base of each shell is 2.5mm brass plate cut with hole saw and finished by spinning and filing (my lathe has a busted chuck so I had to improvise with my drill press). The end product is pretty good and is ready to have some bullets and fake primers fitted. 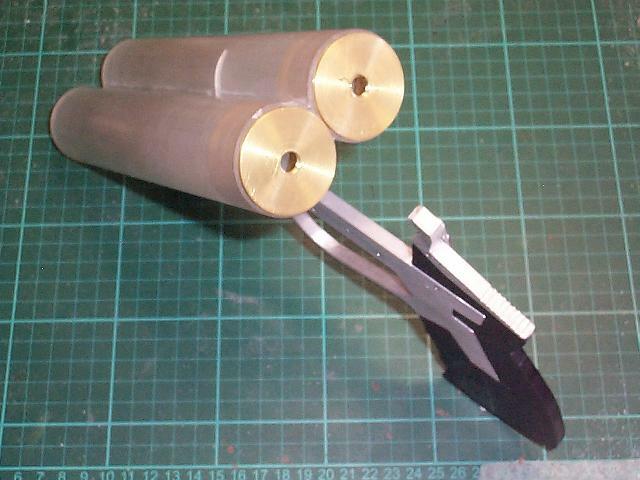 They slot into the barrels nice and accurate but not too tight, I had to spin off ~0.2mm brass. The tube is ~31mm internal, shells were just a bit too tight, now they’re just under 31mm. Not a bad find – for re-purposed hose fittings! The main bulk around the barrel – hinge area is in place, this took a surprising amount of time, shaping and fitting it to the barrels. It’s nice and square. I glued these parts in place as there’s no moving parts underneath. I use an epoxy based filler adhesive which not only glues things together very firmly it also fills in any small gaps. I’m aiming to have this part look like a single machined metal piece so joins and gaps have to be eliminated. I’ve also made a start on shaping out one half of the grip bulk. 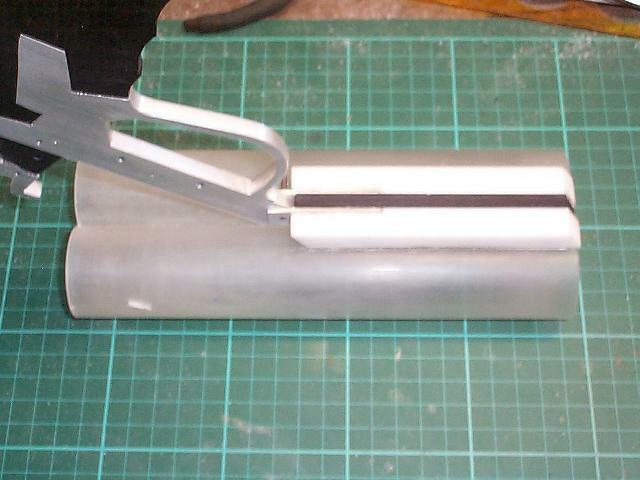 There will be two of these, one on each side of the grip making up the bulk of the gun body. Once I’m happy with the fit, I’ll have these fixed in place with small bolts and begin shaping the ergonomics of the grip. 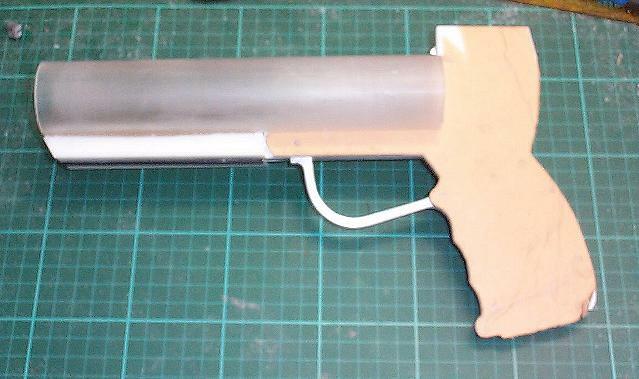 From here on the gun will start to look more like a real object.